Concrete flooring has a long history of strength, durability, and cost effectiveness for a variety of applications including floors, walls, walkways, patios and retaining walls. An increasingly popular alternative to covering concrete is to make the surface both decorative and functional. High-rise condominiums, suburban family homes, outdoor patios to basements remodeled for extra living space are all places where concrete floors are found; and they often include a decorative concrete coating. The most common concrete floor coatings include stain, paint, and epoxy. Another option for concrete floors is to do a decorative stamped concrete finish. 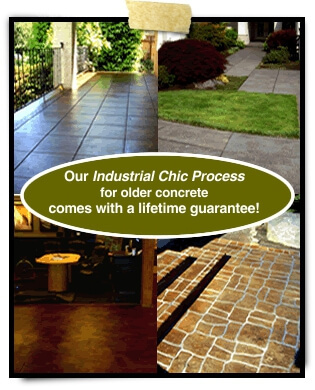 Our Industrial Chic process for older concrete floors comes with a lifetime guarantee. In the past, interior concrete flooring was commonly covered with carpet, vinyl, or other flooring materials. For exterior surfaces, materials like slate, granite, or brick were preferred to standard concrete. The trend in interior flooring is rapidly moving to decorative concrete floors that include everything from concrete floor paint to stained concrete. Budget friendly and durable, exterior surfaces are seeing a rise in the use of decorative concrete as well, and it’s not limited to floors either- everything from decorative concrete retaining walls to a concrete decorative finish for walls are being used. Concrete has definitely become the hot design trend. Concrete can be treated with stains or colorants to create a rich variety of hues and textures. 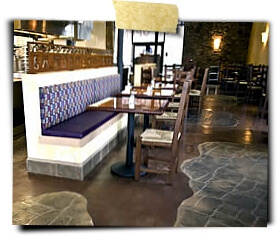 Stained concrete finishes can be applied to existing or new slabs and a wide range of effects is possible. The resulting floor combines beauty and creativity with the economy, durability, and practicality of concrete. The life expectancy of floors treated with concrete stain far exceed that of flooring materials often used to cover them. Carpeting and vinyl are subject to tears, staining, damage from flooding, and general wear. Persons with allergies may also have concerns about dust or molds and many floor coverings need to be replaced every few years. In contrast, concrete stain finishes can last the lifetime of the concrete, and are durable, sanitary, and easy to maintain. This decorative concrete coating may also be used outside and may be as simple as coloring walkways to match architectural features or blend into the landscape. Another way to provide a decorative finish to concrete flooring is to stamp or stencil it with patterns to mimic natural surfaces from marble to wood planks. Concrete floors can be stamped or stenciled to create the appearance of slate or granite, complete with subtle color shifts, surface texture, and real grout placed in the formed joints between pavers. Stamped concrete can also be stained and scored so that the surface can imitate tile, or present a colorful palette of abstract intersecting shapes. Many manufacturers only allow their stamping patterns and color hardeners to be used by trained and certified technicians since all phases of the process need to be properly coordinated. Epoxy concrete floor coating is most commonly used in work areas such as garages, utility rooms, basements, or warehouses. The utility of epoxy is making it one of today’s most popular decorative concrete floor coatings and is its biggest selling point. Yet many believe it has a clean industrial look which has become more popular in modern homes. The largest difference between the epoxy and stained concrete floors is that the stain becomes permanent element of the concrete slab. One of the most traditional uses for concrete flooring is in outdoor spaces, however now people want a decorative concrete patio in place of boring slab. One of the ways this can be done is to do decorative painting on concrete patios. The dull patio in the backyard can be turned into a space with energy and dazzling style by decorating it with a few bright colorful paints and designs. However, when creating the ideal outdoor space people are not just relying on concrete flooring, they are also incorporating decorative concrete retaining walls. For example, homeowners can match the stone facade of their house by installing decorative concrete to create a stone patio and walls without the expense of installing traditional individual stones. As back yards, especially concrete decorative patios are being transformed into luxurious extensions of the house, the heart and soul of these new areas is the concrete patio. Click photo to view additional before and after photos. Contact Your Concrete Guy today for more information or to schedule an appointment to review our portfolio and discuss your decorative ideas.